2014 got off to a shaky start. 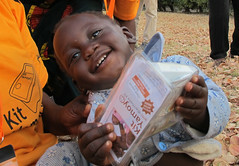 We were grateful to DfID and Johnson & Johnson/Janssen EMEA for providing transitional funding to ensure that there was no break in the supply of kits to the trial areas where mothers and carers had got used to buying Kit Yamoyo in their local shop. However, the third potential funder of the scale-up, Grand Challenges Canada, after some procrastination, decided not to support us. Around the same time DfID decided to close down our accountable body – TMSA – which cut off the supply route for their funding to us and meant we lost our office space and all the support services that went with that. Despite this, we were able to re-plan the funding we had and start the scale-up, albeit at a reduced level of activity than originally planned. Since Mar-14 any wholesaler or distributor has been able to buy Kit Yamoyos directly from Pharmanova with no need to refer to us (ColaLife): in August 2014 the 50,000th Kit Yamoyo left the Pharmanova factory in Lusaka. Everything ColaLife is learning and designing is available for free to other organisations. We are following an open source methodology to share our findings so that we can have as big an impact as possible, as quickly as possible. To enable this we launched our Open Access initiative in Feb-14. ColaLife’s approach for global impact is to influence the strategies of the existing big players in child health, including national governments. We aim to generate robust, credible evidence, and innovative and tested designs and approaches, to share with organisations working to reduce child mortality. These stakeholders are influenced by what is published in peer-reviewed journals, so this will be a key dissemination channel for us to use. However, this process can take time to get results out. So, while we pursue the peer-reviewed journal route, we are also releasing our preliminary results, designs and learning immediately under a non-disclosure agreement. This will allow organisations to use our results straight away, as needed, without jeopardising publication in peer-reviewed journals. We have used Huddle for the day-to-day management of the ColaLife partnership and wish to thank Huddle for extending our agreement with them at no additional charge to allow this secure document sharing to happen. The need to reduce the cost of the Kit Yamoyo to drive out the need for subsidy and make the kit sustainable on a commercial basis. 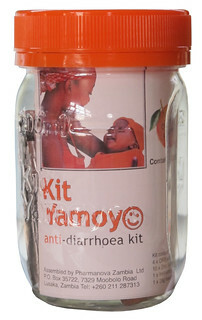 The fact that only 4% of Kit Yamoyos arrived in remote communities in Coca-Cola crates – it was the space in the market for an anti-diarrhoea kit that was important, not the space in the crates. 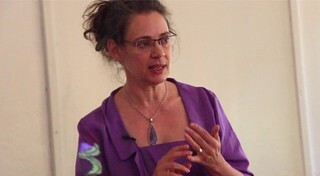 The fact that 90% of mothers used 4 sachets of ORS or less, of the eight supplied. By Nov-14, all components, including the revised packaging designs, were in place in Lusaka ready for roll-out in 2015 when the original packaging supplies are exhausted. Before Jane and I left Zambia at the end of Jun-14 we helped our frontline partner, Keepers Zambia Foundation (KZF), bid into the local Scaling Up Nutrition (SUN) Programme to supply Kit Yamoyo anti-diarrhoea kits into 14 of the most remote and poorest districts in Zambia, where malnutrition is a particular problem. As I type this, KZF are finalising their contract to deliver this project. 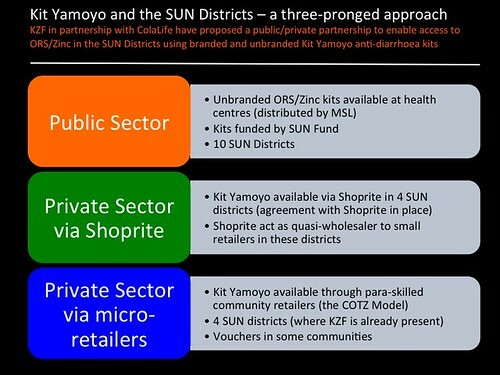 This will complement our wider private sector scale-up plan, because as well as using our tried and tested model – selling via micro-retailers – the SUN funding will support the Zambian Ministry of Health with a budget to supply Kit Yamoyos through the public sector (health centres). This will provide an ‘anchor customer’ for our pharmaceutical partner, Pharmanova. While the SUN project is underway, we will continue our efforts to get co-packaged ORS/Zinc on the Ministry’s essential medicines list. This will mean that health centres can continue to order it into the future. The SUN project will also establish a working relationship with one of the national supermarket chains in Zambia – Shoprite. In mid-May-14 we started to deploy Android tablets running Dimagi’s CommCare application. With a minimal amount of support from Dimagi (small implementations of CommCare are free), we tailored the application to follow the normal visit process that the field staff undertake, capturing the data on the tablets. The tablets work offline but when linked to the internet the data stored on them is uploaded to an internet-based server. Retailer details: name, gender, contact details, shop type (grocery store or drug store), location (latitude/longitude), nearest health centre and more. 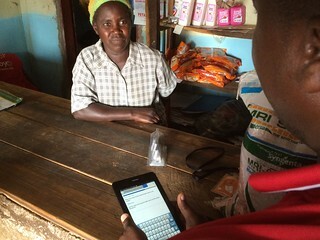 Visit information: date/time of visit, whether the person staffing the shop has been trained, the presence of the training cards, wholesaler being used, sales, retail price, wholesale price, stock levels, whether the Kit Yamoyo sign is displayed outside the shop, whether the product is displayed well and follow-up actions needed. Metadata: name of the fieldworker and their activity level. Although the visit form takes less than 2 minutes to complete, a mass of unique information is collected which is invaluable for the effective management of the supply chain. In Mar-14 we were pleased to collaborate with the Clinton Health Access Initiative (CHAI) in their work to test different ORS and Zinc ‘concepts’ with mothers in Nigeria, Uganda and India. For this we produced ‘unbranded’ versions of our prototype Flexi-packs and supplied the video featured above. The outcome of this work was encouraging. 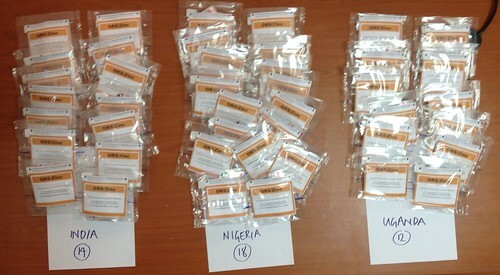 The smaller ORS sachets scored very highly with mothers and they liked the see-through packaging. However, some observed that there were “no instructions” as these are on the enclose leaflet, which they couldn’t see. We’ve acted on this feedback and the production versions of the Flexi-packs have the instructions printed on the back of the flexi-pack, as well as on the leaflet inside. We are very grateful to our packaging partner, Amcor, for their offer to sponsor the first 870,000 Flexi-packs free of charge. This will translate into lower production costs for Pharmanova and lower pricing. 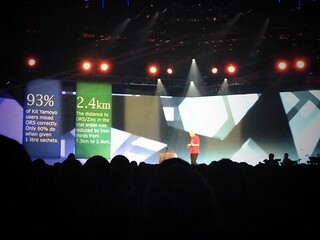 I gave a keynote presentations at C2MTL (Creativity & Commerce Montreal) on 28-May in Montreal. The presentation was late morning on day 2 and was delivered to around 1,500 people. It was the first keynote to get a standing ovation. I used the opportunity to visit Wilmington where I delivered the after dinner speech at the DuPont Packaging Awards (we won the diamond award last year). 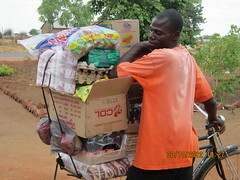 My task was to explain why we are moving away from our award winning packaging, at least in Zambia! See item 3 above. I also visited Rohit in Toronto and spoke at the William Davidson Institute of the University of Michigan at the invitation of our Virtual Advisory Board Member, Prof Dr Prashant Yadav. Finally, I linked up with Rohit and Claire Ward in Seattle where we screened Claire’s film – The Cola Road – twice: once at Microsoft and once at The Gates Foundation Visitor Center. I also visited colleagues at PATH and presented to their network via video conference. 8. More awards and accolades! 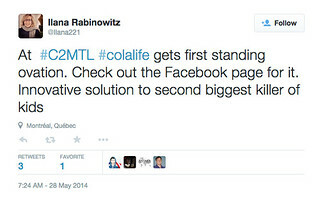 Following on from awards won in 2013, ColaLife continued to be noticed. We were honoured to win the FT/IFC Business Transformation Awards (Health) jointly with our funder: Johnson & Johnson/Janssen EMEA. The UK division of our packaging partner, Amcor, won the 2014 ‘Amcor CEO’s Outperformance Award’ for their work for us; their prize was 5,000 Australian dollars for the charity of their choice, and we collected our first ever ‘Big Cheque’ in Dec-14. We were delighted to be selected by a private foundation for a grant which has helped us enormously through the funding difficulties this year, and has been vital for dissemination and continuing support to our Zambian partners. As I write, we are in fourth place in the Global Giving Year End Challenge: over 60 donors have helped us raise over $11,700 dollars, which puts us in a strong position to win a $1,000 bonus by 31-Dec. Here’s the leaderboard. In addition, Inc.com listed The Cola Road as one of top 5 documentaries to watch in the Spring of 2014: 5 Documentaries About Entrepreneurs You Need to Watch This Spring. 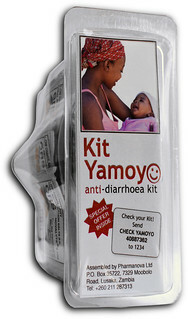 And in Mar-14 the Kit Yamoyo was featured at the Best Buys for Global Health event. In Mar-14, in partnership with iDE Zambia, we were delighted to get through the tough concept note stage of USAID-DIV and were invited to submit a full proposal to them for the funding we needed for the scale-up plan. In May we completed the full bid and we were told to expect a response in July. Unfortunately we are still waiting. In the meantime, we’ve received encouraging feedback, but nothing official. As time passes it looks less and less likely that we will be successful but it is encouraging that we got as far as we did with such a high-profile funder. This may seem like an odd ‘achievement’ but not for an organisation such as ColaLife interested in sustainable solutions. Jane and I did leave sooner than we had hoped due to the funding challenges outlined above but it is great that, despite the difficulties, things are carrying on without us. We are committed to a return trip every quarter to support where we can until a full national scale-up is in place. Our first return trip was in Oct-14 and we will return again for 3 weeks in Feb-15. Finally, as we say every year . . . a big thank you to everyone who has supported ColaLife throughout 2014. We are making great progress. We couldn’t do it without our supporters. You are the foundation of everything!